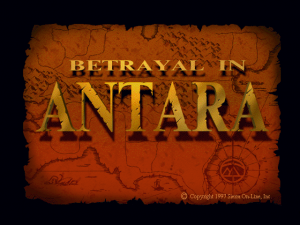 This is only a quick guide for adventurers to consult when Betrayal in Antara. Only its main objectives are covered in detail. A few solutions to Antara’s many optional adventures are included but many more are left for adventurers to discover and solve for themselves. As always, this hint guide is intended for those who are new to this kind of RPG. The solutions to the lever chest riddles are (in no particular order): Emerald, Denna, Corlene, Torchite, Valorian, Onyx, Jaeger, Shira, Consul, Triune, Cutlass, Shadows, Glass, Wick, Montari, Aurora, Chail, Mehrat, Halder, Derek, Chumen, Kirith, Fidali, Hand, Harkune, Calderleaf, Malkere and Midova. If you are new and feel intimidated by old school RPGs, then you are in luck! Antara is a walk in the park on Easy, and will likely prove too easy after a few hours of gameplay. If you have played some RPGs in the past, consider choosing Medium. The game is divided into chapters. 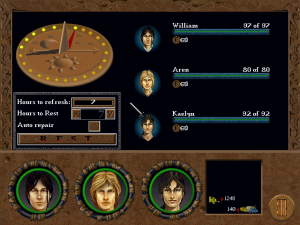 Each chapter has a main task to complete as well as many optional adventures. 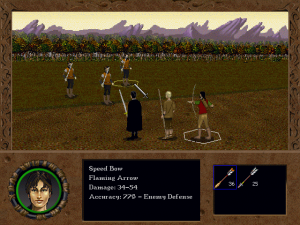 The game begins east of Briala. Click on the body in the road and click/drag items from it to your party. After stripping the body, save and go west to Briala. Check out the world map for locations. When it gets dark, get off the road and camp. Sleep until dawn and resume traveling west. Camping (and resting) is the cheapest way to partially heal your party. 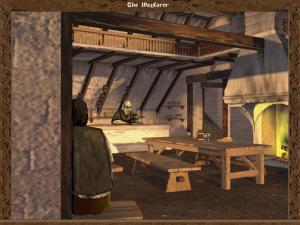 Paying for a night in an Inn fully restores health points. During combat, protect your party members by moving them away from the enemy when they are badly injured. Kill enemy magic users before they can cast their spells. Replay a battle if any party member is so badly hurt that they can’t restore their health points while resting. Every item you find can be sold to a shopkeeper, but each village has different shops that only buy certain items. In Briala the shopkeeper will not buy armor or weapons, but he will in some of the villages to the south and in Imazi to the west. To sell items to a shopkeeper, enter the store, click on the shopkeeper, then click on one of your characters. Click/drag items you want to sell to the shop’s icon in the lower right hand corner. The Anvil in Panizo sells chain mail armor. Out your adventurers in chain mail and end the chapter by going to the Escobar Estate in Panizo. In Ligano, talk to Rosie and then Sergeant Kalyx. If the party has defeated the six Montari bands between Ligano and Sortiga, Kalyx will increase the party’s Defense ratings for seven food rations. A nurse in Ligano will increase the party’s Assessment skills for twelve herbal powders. 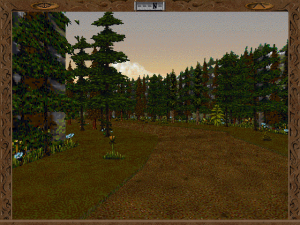 Northeast of Ligano Liselle and the Sisters of Senaedrin need 24 food rations. Talk to the groom’s brother in Sortiga about the missing wedding rings. Use a shovel on a pile of sand on the beach near town to retrieve them. Return them to the groom’s brother for a copy of Acute Sense and Perception. Talk to Farmer Brunia in the Safe Harbor Inn at Balmestri, Lord Garson in Imazi, a group at the Black Sheep Inn in Sortiga and then to Korellyn in the woods north of town. Get her scarf, take it to Lord Garson and return the deed to Brunia. South of Ligano, in a canyon, is a Temple of Henne. Talk to the priest after defeating all the Montari bands and he’ll go to Sortiga to perform the wedding. 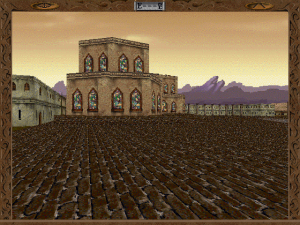 Another priest in the Temple will bless the party, which allows them to enter Farmer Brunia’s haunted field in Imazi. Explore the cave and take the staff from the field. There are other optional adventures in Ligano as well as in Briala, Aspreza, Balmestri, Sortiga, Imazi, Aliero, and Midova. It pays to go back to a town more than once. The party’s main task is to first visit Finch near Midova and then go to Peerless Imports in Midova and ask about Chailan Tea From Paolo. It won’t be available for a week. Come back a week later to find that the shop was ransacked and Paolo is in debt. Talking to Leon at the Greener Pasture Inn will lead the party to Antoni (in his bank) who’ll settle Paolo’s debt (and return his Chailan Tea) for gems from Enkudi. Enkudi is between Sortiga and Ligano. Talk with him to get the gems and a divining rod. Go to the Montari Caves nearby. Go south and turn left. The entrance to the caves is on the left side. Use the rod on the pond in the room beyond Chee to end the drought. Montari chain mail is inside a chest near the pond. Take the gems to Antoni, and go to Paolo to get the Chailan Tea and take it to Finch. After Aren learns some more magic go southwest from Midova to find a canyon to the right that leads across the bridge to Ticor province. Go northwest through the forest to the river. Follow the river west to a section shallow enough to cross, and then go directly to Ticoro and approach the city gate to end the chapter. Before ending the chapter however, there are a number of optional quests worth completing. Because you gave Liselle and the Sisters food for their journey in Chapter One, they’ve cured those who had red ribbons on the doors of their houses in Aspreza. In one of them is a Tinker who will repair one item for free. If you spoke to Doc Myers in Balmestri about Lonzo’s sick calves, Lonzo will reward the party in Briala. The father of a sick boy in Waterfork will give the party a banded shield if they give him fidali paste to heal his son (mix fidali leaves and ale). A fisherman (also in Waterfork) will give the party a Henne’s Horn that reduces the amount of rations they need to eat – if they slay the three bands of Masliths near the town. Flaar, a wounded Grrrlf, is hiding in the forest just outside of Cardone. Combine a nudberry root with a food ration to make nudration, an food that will calm him down enough to talk. For one hundred burlas a mage in Ormede will help Aren with his magic skills. An apprentice smith in Levosche will increase Aren’s Defense skill. Placing an emerald on the bust of Emperor Valorian in the local museum reveals a secret compartment with a Circlet of Senaedrin. The Circlet heals the poisoned twice as fast. 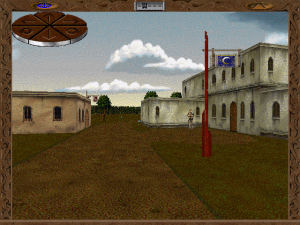 There are other optional adventures in Briala, Aspreza, Sortiga, Imazi, Midova, Aliero, Waterfork, Cardone, Levoshe, Ormede, Ravenne, Melay and Varnasse. This adventure takes place entirely in Ticoro. Make sure the party brings plenty of senwater in case they can’t find the Henne’s Shadow Inn (it’s in the northeast section of the city (to the right after entering the gate) – there’s no other place to rest and plenty of battles. In the Inn, talk to Scott Gratisi and then the innkeeper and then to Scott again to rent a room. To survive Ticoro, sleep at the Inn every night and buy extra senwater at the General Store. Talk to Lord Caverton at his palace and show him the Shepherd medallion. Go to the Tabernacle of Henne and talk to Fellich Marr about the Daughter Heir. Continue north to the gatehouse and talk to the guard. Try to open the western rampart gate then go to the Knight’s Promise Inn and talk to Selana and show her the Shepherd medallion. Go to Keys and Bolts and talk to Coulaine and ask for the Rampart Key. He’ll send you on a mission. Go to the southeast corner of town and catch Torrance, then talk to Coulaine again to get the key (talk to Torrance again to pick up some lock picking skills). Open the gate, go north, then east, and click on the hole in the ground. Go to the southwest quarter of the city to The Green and the White Inn. Talk to the sitting guard. Return to the Henne’s Shadow Inn and the chapter ends. More optional quests located in Ticoro. Aren can learn another magic skill at Camille Farray’s house. Aren and William’s primary objective is to find the Shepherd’s lair. Their search will take them first to Mackey on the road between Ticoro and Varnasse, to Maria Liana in Isten, to the temple in Durst, to Fellich Marr outside the city gates of Ticoro, to Simon’s house in Ravenne (to read a note), and finally to Simon in Levosche. Simon knows the location of the Shepherd’s lair (Ticoro) and also where to find his old Shepherds’ medallion (buried in his garden in Ravenne). North of Ticoro is the door to the lair. To open the lock and end the chapter, use the medallion on the slab of rock and then turn the dial clockwise to five o’clock, counterclockwise to one o’clock, and clockwise to ten o’clock (examine the back and the front of medallion to learn the lock’s combination). A mage in Isten will teach Aren magic skills for a fee. Thomas and Stuart in Ravenne will teach Aren magic on a second visit after refusing on the first. Naomi in Varnasse will teach Aren magic skills if he delivers nutrients to her cousin Noal in Elona. Learn of the magistrate of Levosche’s suspicions that the Ampersands are Mehrat spies when it’s really the magistrate who is the spy. Get a diamond and an increase in Assessment skills for choosing the right side in this fight. Once you have completed these tasks, you can choose to move on or solve more optional quests spread far and wide in this area! Explore Korus Landing, Isten, Everton, Teal, Elona, Burlen, Eastbank, Camille, Durst, Friole, Varnasse, Melay, Ravenne, Cardone, Levosche, Ormede and Waterfork for more optional adventures. Restore Ridgewood to order. Go east through Durst and Friole and then north past Darvi to meet Krrrfrrrlaak and learn of the troubles in Ridgewood. Then travel north to Kaelyn’s house near the southern edge of Ridgewood to read a note from Garvin, her father. 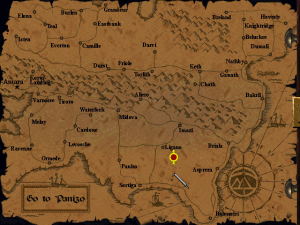 The note directs the party to a cave to the north. Avoid any battles with Wraiths while searching for Garvin. They are highly lethal. The party will find a clear northern path to the cave, eventually. Garvin will enchants the party’s weapons so they can slay all the Wraiths and undead haunting the Ridgewood. After the slaying is finished, return to tell Garvin and the chapter ends. A father in Durst has a missing son. Rescue him and return to his house to get a copy of The Adventures of Caarl Maston (increases Melee, Scouting and Stealth skills). The boy is north of town in the canyons on the outskirts of the Waste. There’s a copy of A Social Analysis of Organisms (increases Assessment skills) at the Feral Duck Inn. Kaelyn can increase her Archery skill for a fee at a hunter’s house in Darvi. Thoroughly explore Durst, Darvi and Grandeur for additional but optional adventures. The primary objective is to search for the consort. Escape the Shepherd’s lair by finding the lever chest. Solve it by spelling Malkere, and then take the glass tube to the mosaic puzzle, click on the door, place the tube on the candle and press the now highlighted buttons in any order. Go to Gar Warren’s cave, talk to him and after an interruption go through the cave’s secret door and then east to the Pearl Spittoon in Ganath and talk to Khorus Bale. If William drinks a Halder’s brew potion and then wrestles Khorus, Khorus will direct the party to Lokath outside the Tapped Barrel Tavern in Choth. Lokath will refer the party to Birge standing at the gates of Lord Garson’s estate in Imazi. Seek help for Birge from Chee in the Montari Caves and then take Birge’s note back to Lokath in Choth. Take Lokath’s note to Kahleth in the training camp just south of Choth. Kahleth will ask the party to give some mercenaries swampwalking potion. The mercenaries are north of Torlith towards Darvi—along the narrow band of dry land beside the swamp. After the mercenaries drink the potions, follow them through the swamp to the cabin. Click on the cabin door to end the chapter. Kill the lightening bugs plaguing the wilder mage in the swamp southeast of Torlith and give him some grounding wire, he’ll give the party a winterstaff. Give wine to The Bannerman barkeep in Bakril and get a suit of blessed plate mail. Talk to a father in Imazi and then to his daughter. Give her a sword and get a ten point Assessment bonus. Thoroughly explore Toruth, Choth (the reward for picking a winner for the festival varies from nothing if you pick the Hero, to an Everedge sword and tower shield if you pick the Soldier), Keth, Bakril, Imazi, Ligano and Ganath for additional adventures.